The 5 Phases of Disease is a model of biological terrain based on the science of biophysics as developed and clinically implemented in Bioelectronics of Vincent (BEV). In European Biological Medicine, BEV is known as the Medicine of the Future, both because it is how Medicine will grow to be more effective at understanding and facilitating health, and because it is highly predictive, rather than reactionary. See Dr. Glen's flowboard slides below the three parts of the TV show for additional imagery related to the 5 Phases model. The first page shown below is a slide that shows all 5 terrains. Phase 1 shows viruses attaching to a cell in the lower left. Phase 2 shows bacteria in the upper left. Phase 3 shows fungi in the lower right. Phase 4 shows algae in the upper right. Phase 5 illustrates a mitochondrion in the center. Phase 5: Balance (life stresses and endocrine issues). The page for each phase shows a video in the center. The first four are actual microscope videos, while the final one is an animation. Which of the Five Phases of Health are You in? 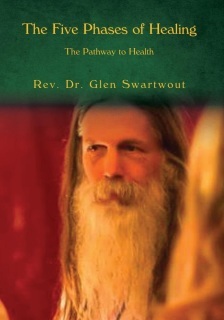 Since you are reading this page, watching the TV show on the 5 Phases of Healing, and looking at the slide show above that illustrates the kinds of biological entities that can grow in the five terrains, you are probably starting to ask yourself, "I wonder what terrain I am in..."
As with any observation, the answer depends on the context. By comparing the biological terrain in these three compartments, doctors have learned to interpret a lot about how your body is working to digest (saliva), nourish and cleanse the metabolically active parenchymal tissues of the body (veinous blood) and detoxify (urine). You can also look at your Phase of Health from the point of view of any symptoms and signs you may be conscious of. You can submit our simple 5 question survey here. When you send in your survey along with your recent photograph and a few other simple details, we can then tune in empathically to your energetic state in real time. Sure, that sounds pretty "woo-woo", I know. Trust me! But I have been doing this clinically for 3 decades, and it works perfectly. It is a form of surrogate testing, which actually developed from the observation that mothers empathically take on their baby's functional response pattern during breast feeding. But we now also have plenty of confirmation from remote healing studies, that even with a simple photograph as the only link, people who are receiving prayerful intention heal significantly faster and better than those in control groups. It is time that the world wakes up to the spiritual reality of life and healing. We care about each other, and that makes all the difference in the world. We are connected, beyond the apparent separations in time and space. You are actually a transcendent being, and your healing and spiritual growth is the most valuable result imaginable. Let us begin showing you how you can navigate more efficiently toward your destiny, your Future Self.